We are thankful that Jeremy's ankle is back to "normal" again. Hopefully he doesn't sprain it a third time! Praise God! This morning was such a special occasion for us as we excitedly watched both our children receive the citizenship awards for their respective classes at the honour assembly. Stephanie's was for "her willingness to help and care for others". Jeremy's was for "being a wonderful roll [sic] model for KV" - his teacher is going to arrange for a replacement certificate for him! We are especially thankful that Jeremy was even at the assembly today - that God healed him and brought him safely through his transplant, and that the doctors wanted him to start Kindy at the beginning of the year (even though technically he was supposed to be in isolation at home until 2 weeks ago). We give thanks for another day of joy with our two children. We are pleased that Jeremy has recently made some of his own Kindy friends! He already has lots of Year 2 friends, thanks to Stephanie, but it is nice that now he has been able to socialise by himself too. It was a beautiful day today - nice and warm in the morning, and cooling down early in the afternoon. Jeremy sat in with us at church today because there were some sick kiddies at Sunday School. As we have not yet got the results back from his 6 months immune function test, we thought it wiser to take this precaution. He was a bit too energetic to sit through the service quietly, but he managed to get through without driving everyone around us crazy (well, at least they didn't turn around!). In other news, it seems that Jeremy is finally starting to suffer from a bit of vertigo when he is hoisted up high. Stephanie and Jeremy also had a surprise visit from PawPaw and KonKon, who entertained the children with beanbag rides. The Children's Circus Extravaganza was held under the big top. We were able to attend this year thanks to Cure Our Kids. The Rotary Club of Liverpool West arranged it, and the circus was located in a corner paddock on the Liverpool Catholic Club grounds. It was similar to last year's circus in that it did not involve animals. However, the acts were different, and this time plastic seats were just placed over grass (as opposed to being indoors). Being in a tent, it started getting quite warm - you could see the clown sweating under the lights. The show was two 45minute sessions with a short interval that cleverly plugged the jumping castle offering outside. Our children especially liked the two aerial ribbon acrobats, the aerial hoop artist, and the hula hoop performer who kept 4 hoops twirling around her body. In fact, Jeremy announced that he wanted to be one of the aerial ribbon acrobats! We were really thankful that the fever has disappeared, as if we had to go to hospital, we would have missed out on this (you get stuck in hospital for a minimum 48 hours). Stephanie and Jeremy finished Week 9 of school by attending the Year 2 Easter Egg Hunt! Wearing latex gloves (because of their allergies! ), they excitedly looked for Easter eggs which were melting very fast in this hot weather! Then they had fun giving out the eggs that they had found, and enjoying their own dairy-free nut-free chocolate. Last night was an anxious and exhausting night checking on Jeremy every hour or so and watching his temperature go up and down. Thankfully, we were spared the ordeal of having to go to Emergency in the middle of the night (which would also have meant a hospital stay of at least 48 hours for IV antibiotics) and we were relieved when his temperature came down to 36.8 at 4am this morning. When he woke up in the morning, he said that he was fine and happily walked to school for his Kindergarten parent/teacher/student interview. His teacher is very pleased with his efforts, but told us that sometimes he tends to rush through his work so that he can be the first to clean up the classroom! He felt warm when he came home from school this afternoon, but was otherwise his usual active bouncy self. As his temperature was 37.5, he was given more Panadol - however, by dinnertime he had cooled down and hopefully we will have an uneventful night tonight! Jeremy went to hospital clinic today for his "6 month bloods" which will check how his immune system is recovering, whether or not he can start having his childhood vaccinations again, and whether or not he has lost his food allergies. We will know the results in a week or so. He also had his first of two Fluvax injections. At bedtime tonight, he said that he was cold. We took his temperature and it was 37.6 degrees, so we rang Camperdown Ward for advice. They told us that we can give him Panadol now (when he had a central line, he was only allowed Panadol after he had spiked 38 degrees, had been admitted to hospital and the nurses had taken blood cultures) and to call them back if he goes over 38 degrees or has the shakes/shivers. Hopefully, it is just a side-effect from the Fluvax as it is common to experience flu-like symptoms afterwards. After school today, Stephanie and Jeremy were excited to visit their preschool for Jeremy's preschool reunion. It was so good to see their "old" teachers and to play in the new playground. It was Jeremy's first time in a sandpit since transplant, and he especially loved playing in the wet and dry sandpit. Unfortunately, Jeremy is limping again - same ankle, same problem. We have strapped up his ankle, and will take him to see the doctor about it. The pink Barbie cap that once was lost, but now is found! LOST! 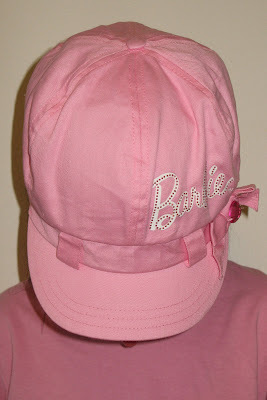 One pink Barbie cap (baker boy style). Otherwise, the kids had a great morning at church - there was a special treat of sour worms at morning tea! And this afternoon, they had fun pruning the bushes in our backyard - the first time that Jeremy has been allowed to help in the garden since transplant! A fun, happy day with family eating BBQ chicken, having rides on the "housie housie" blanket, making jin deui, and enjoying Stephanie's delicious egg-free dairy-free nut-free chocolate cake. Jeremy continues to drink all his water at school, which was especially important today because the weather was so hot. He has now finished Week 8 of kindy, and is still loving it! We are thrilled to find out today that both our children will be receiving an Honour Award at the end of term Honour Assembly, which is held during the last week of term. We are so happy that the doctors wanted to give Jeremy the opportunity to start Kindy this year, and our hearts are full of thankfulness that he was given the chance to have a bone marrow transplant. This morning Jeremy went to visit the dentist at the Westmead Children's Hospital, and came home with photos for News at school tomorrow! His teeth and gums are fine, and he will have another checkup in 6 months time. Jeremy came home yesterday afternoon and this afternoon with an empty water bottle, and proudly told us that he had drunk all his water at school. We are pleased that he has decided to drink at school - or maybe that he now feels more comfortable using the school toilets! Today is 6 months post-transplant, and we praise God for his merciful healing and protection of our beautiful boy. We thank Him for 6 months of new life and hope, and for the daily blessing of being a family together at home. Even youths grow tired and weary, and young men stumble and fall; but those who hope in the LORD will renew their strength. They will soar on wings like eagles; they will run and not grow weary, they will walk and not be faint. 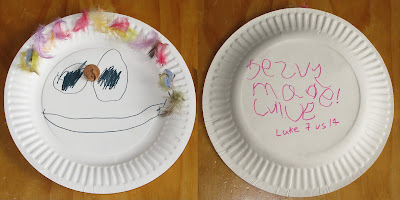 After creating this artwork at Sunday School, Jeremy wanted to play at church so he asked first our housegroup leader and later our minister to chase him around the courtyard. It was easy for them to lose sight of the cheeky little boy, as there were so many people at morning tea! So instead, our minister gave him the task of handing out leaflets to the church people there, and he was very proud and pleased to be able to help. Jeremy asked to play at big swing park this morning, so we went out for a short outing, which finished with Jeremy's first Easy-way soy drink. 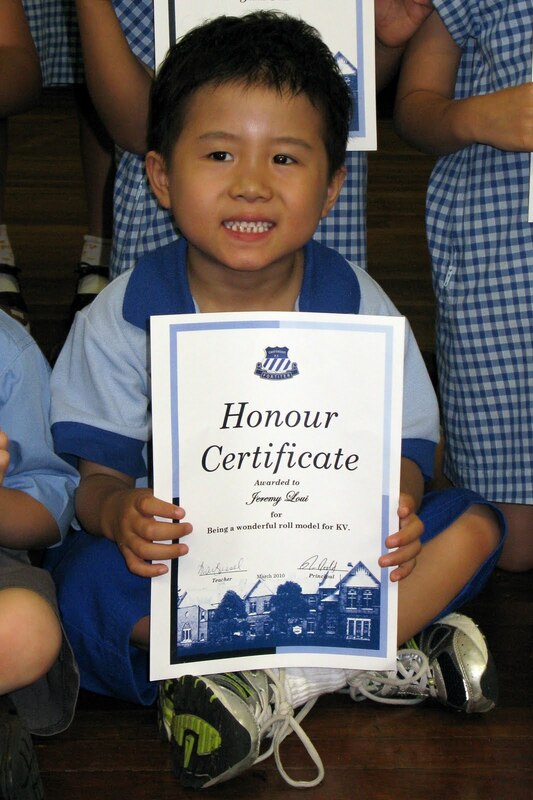 Jeremy has finished Week 7 of kindy now. We are so thankful that he remains in good health and has not caught any kiddy virus, especially since he is still supposed to be in isolation post-transplant. We continue to pray that he will be protected from sickness and will be able to enjoy the rest of his kindy year. Praise God that Jeremy's ankle is back to normal! We are also thankful that it didn't seem to bother him when it was sprained. He simply adjusted to running around with his foot in a different position, and still wanted us to chase him all the time! S: I spy with my little eye, something that starts with "W"
S: No. I'll give you a clue. It's a place where there are lots of shops all together. Jeremy's skin is more susceptible to sunburn because he had chemo and TBI - he needs to cover up and use a high factor sunscreen whenever he goes outside. He has a tube of sunscreen in his classroom, and his kindy teacher tells us that he is very diligent in putting on his sunscreen before recess and lunch. When I had to go to school at lunchtime one day, I saw that his face still had white smears of sunscreen on it that he hadn't managed to rub in properly! And of course, the school has a "no hat, play in the shade" policy. This morning we worshipped with Dr KonKon at his church. It is humbling to know that his church members (who we do not know) have been praying regularly for Jeremy over the past year. We are also thankful for so many of you (both those who we know and those who we are yet to meet!) for your love and prayers for our little man. You have shown us that we are all part of God's big family. Today, Jeremy managed to have a bit of a sleep-in (he was not the first child to crawl out of bed this morning!!). Surprisingly, we still got out of the house early to make a quick dash to get a pair of sports shoes for Stephanie. Jeremy was given a special treat - he had his first Boost juice post-transplant. He was so excited about it, as it has probably been 9 months since he has had one. We bought them a large sized drink each to avoid fighting, and they slurped away at the drink all the way home. After an early-ish lunch, the kids were able to run around and play, and we are thankful that Jeremy was still quite mobile despite his ankle being strapped. Jeremy went to see the doctor again before school, who noted that his ankle is getting better. Instead of walking on the ball of his right foot as he did when he first hurt his ankle, Jeremy is now walking on his whole foot but turning his foot out slightly. He says that it doesn't hurt - and still wants us to chase him around all the time! Jeremy was very excited to get his Mathletics logon and password from school today, as Stephanie had got hers earlier this week. He rushed home and wanted to make a start straight after his afternoon tea. Jeremy is happy to play with Stephanie and her friends at recess and lunch, and the nice thing is that they seem happy to play with him too! He must have missed her so much last year, that he wants to spend as much time as he can with her this year. Thank God that Jeremy only has some soft tissue damage around his ankle (aka a sprained ankle), which the doctor says should resolve itself in a week or so. It is fine for Jeremy to walk on it, so afterwards he went to school just in time for a fire drill - a very exciting event for the kindy kids! Jeremy has been limping recently - hopefully it is just a sprain or something else minor. He is not in pain, is otherwise happy and still insists on walking (and running!) on his right foot. We will take him to see a doctor tomorrow. It was another beautiful Sunday, and Stephanie and Jeremy had a good time at Sunday School. Afterwards, we had a special lunch of chicken and chips for the kids. Although for many months Jeremy had turned his nose up at "hot chippies", today he was just as excited about them as Stephanie. This afternoon, we tried to tidy up Jeremy's hair (around his ears only) in readiness for the school photos tomorrow. However, we found out that cutting wavy hair is much different to cutting straight hair, and we will need more practice! Fortunately, the photo will be taken front-on facing the camera, and he will still look very handsome!